The House of Lords, Britain's highest court, delivered a landmark ruling on July 30 when it said that the nation's assisted-suicide law must be clarified to spell out the circumstances under which authorities will prosecute someone who helps another person end their life. According to Britain's Suicide Act of 1961, "a person who aids, abets, counsels or procures the suicide of another" faces up to 14 years in prison. To get around the law, more than 100 British citizens have traveled to Switzerland to end their lives at Dignitas, an assisted-suicide clinic in Forch, near Zurich. But so far, no one who has accompanied a person to Dignitas has faced prosecution after returning to the U.K. The vagueness of the law pushed Debbie Purdy, a British woman suffering from multiple sclerosis who plans to end her life at the clinic, to approach the court about forcing prosecutors to state whether her husband Omar would face jail time if he accompanied her to Switzerland. After the court issued its decision, Director of Public Prosecutions Keir Starmer said he would immediately begin drafting an interim policy to specify in what instances prosecutions should or should not be brought. He plans to complete those guidelines by September, and to issue a final version by the spring. Speaking outside the House of Lords following the ruling, Purdy, 46, said she was "ecstatic," adding: "The decision means that I can make an informed choice, with Omar, about whether he travels abroad with me to end my life because we will know exactly where we stand." 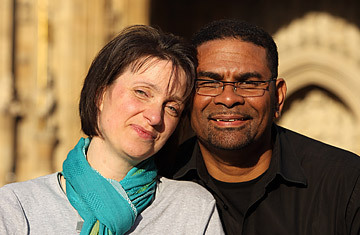 Purdy, who has been confined to a wheelchair since 2001, argued that the lack of clarity in the law could force her to end her life sooner than she would like. She said that if she were to wait to end her life until she was completely dependent on her husband, she would be placing him at risk of imprisonment  meaning the only option left to her would be to travel to Dignitas alone, before her illness progressed that far. Thursday's ruling said that the legal ambiguity violated Purdy's basic rights, and interfered with her ability to choose how she dies  a right enshrined in the European Convention of Human Rights. "Everyone has the right to respect for their private life, and the way that Ms. Purdy determines to spend the closing moments of her life is part of the act of living," the ruling stated. This isn't the first time someone has challenged the clarity of Britain's assisted-suicide law. In a similar case eight years ago, Diane Pretty, who had motor neuron disease, wanted to know whether her husband would be prosecuted if he helped her die at home or accompanied her to an assisted-suicide clinic abroad. But the court rejected her request for clarification, and her illness took her life in May 2002. In seeking to clarify the law, Michael Smythe, head of public policy at law firm Clifford Chance LLP in London, anticipates that the Director of Public Prosecutions will define what kinds of people  with what kinds of illnesses  others can assist with ending their lives. "You can imagine the public brouhaha if the guidelines permitted those who were temporarily ill or not very ill to be assisted in their premature passing without any sanctions for those assisting them," he says. For anyone who thinks the guidelines will make it easier for people to travel to commit suicide, experts point out that with clarity could come a rigidity that ends up punishing people who have up until now escaped prosecution. In practice, ambiguity can be a good thing, says Emily Jackson, a professor of law at the London School of Economics. "The ambiguity in the law has allowed a degree of discretion to be exercised on compassionate grounds," she says. "If there is a very clear set of criteria, there may be pressure to prosecute any case which might look as if it falls outside the guidelines, but where previously it might have been possible to exercise discretion ... and take the individual circumstances into account." Whatever the new rules say, experts agree they aren't likely to delve into too much minutiae. "[They are] not going to clarify that driving someone to the airport is O.K., but getting on the plane with them isn't," Jackson says. "[They are] much more likely to specify relevant factors such as whether the person who assisted with the suicide stood to gain any financial advantage, or exerted any pressure on the person [who committed suicide]." One thing is for sure, though: the clarified rules will deal only with people who travel overseas to assist with suicide and won't change the fact that helping someone die in Britain is illegal. And that, says Dominic Wilkinson, a medical-research fellow at Oxford University, raises other ethical considerations. "If we think it's O.K. for people to go overseas to end their lives, and it's not illegal for them to do it or for people to help them do it," he asks, "why do we think that people who want to do the same thing in this country shouldn't be allowed to do so?"